John Wayne Cleaver (Max Records) is dangerous. 16 years old, he is obsessed by serial killers and shows a little too much interest in his Mum’s mortuary business. Even his therapist agrees - he has all the key symptoms of a budding sociopath. John does not want to become a serial killer. As a result, he lives by rigid rules to keep himself “good” and “normal”. When somebody starts murdering people in his small Mid-West town, John’s high level of serial killer expertise compels him to investigate. However, while stalking this monster, he risks setting his own dark side free. I Am Not A Serial Killer, is utterly gripping from cinematographer Robbie Ryan’s very first, stunning shot. From inside a police car, we witness a body being removed into an ambulance. There has been a terrible murder in a small, sleepy town and, incredibly, the only person with the knowledge able to catch the killer is a 16 year old sociopath on a pedal bike. John Wayne Cleaver is a unique and intriguing character. Wonderfully played by Max Records, he is both hero and potential monster. His obsession with serial killers and his fascination with the dead bodies at his family’s mortuary (cue some body horror-inflected scenes) is unsettling even as we sense decency within. John’s investigation leads him to the home of his elderly neighbour, Crowley. This feels like the role Christopher Lloyd has been waiting to play. He gives a truly superb performance in this movie - his scenes with Records are brilliant. 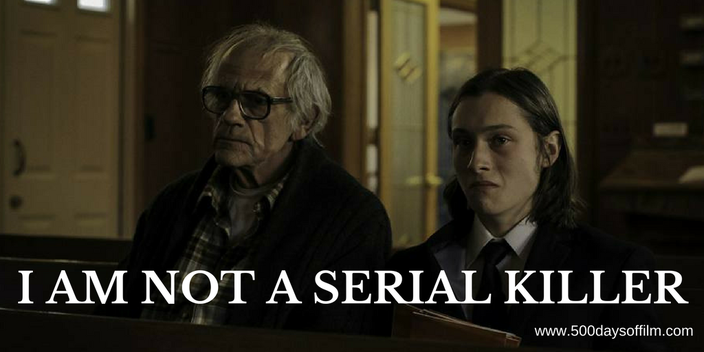 Adapted from Dan Wells’ novel, I Am Not A Serial Killer sets off on a fairly familiar path. At least we think we know where the film is headed: young outsider tracks down the serial killer in his small town, putting his own life in danger in the process. However, I Am Not A Serial Killer reveals its monster surprisingly early. In lesser hands, this move could have led to the loss of the film’s chilling and suspenseful atmosphere. Instead, director Billy O’Brien cranks up the tension further, mixing black comedy with his story's dark and disturbing heart. In its final act, the film takes yet another turn. While this is a slightly harder pill to swallow, I Am Not A Serial Killer has entertained and thrilled us and so we are willing to go with the movie as it reaches its dark and somewhat fantastical conclusion. cinematographers in the business. You can admire his work in Slow West, Fish Tank, American Honey and I, Daniel Blake. I Am Not A Serial Killer has been likened to Donnie Darko. While this film is far easier to grasp, it does share a similar off-kilter tone… and a troubled boy on a bike. Have you seen I Am Not A Serial Killer? If you have, what did you think about Billy O’Brien’s horror thriller? Let me know by leaving me a comment in the box below!